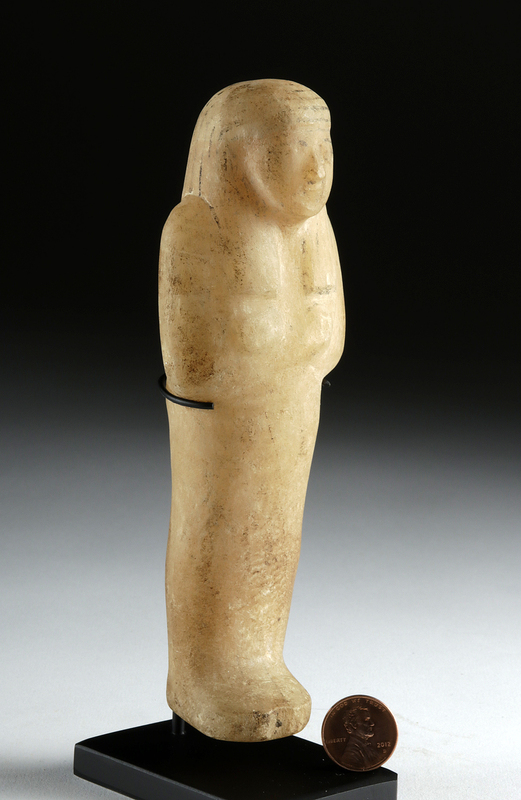 Ancient Egypt, Third Intermediate Period, 21st to 25th Dynasty, ca. 1069 to 664 BCE. 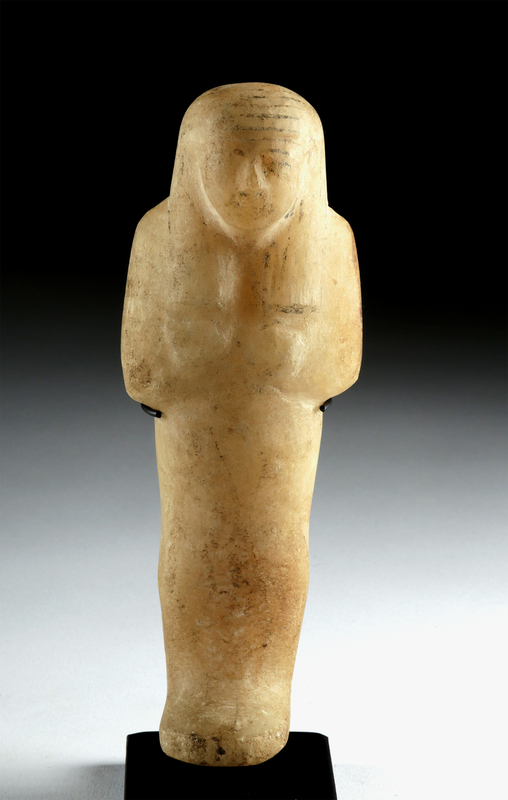 A standing ushabti figure, hand-carved from a creamy-yellow alabaster with faint bands of darker hues across the back of the upper body. 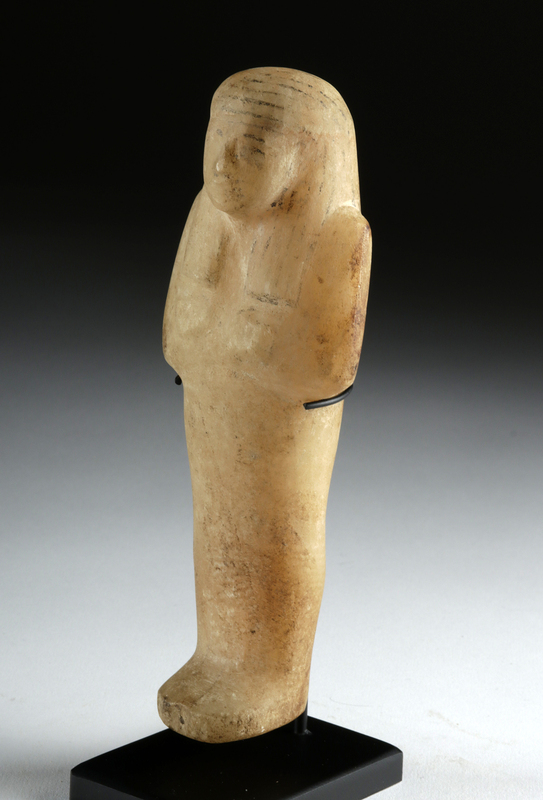 The figure stands in mummiform with fused legs atop a lightly-rounded base and has crossed hands held against the chest beneath sloping shoulders. Raised facial features like a perky nose, full lips, and a rounded chin comprise the minimalist visage, with traces of black pigment denoting where the eyes were placed. A tripartite wig bearing similar faded-black striations tops the head. 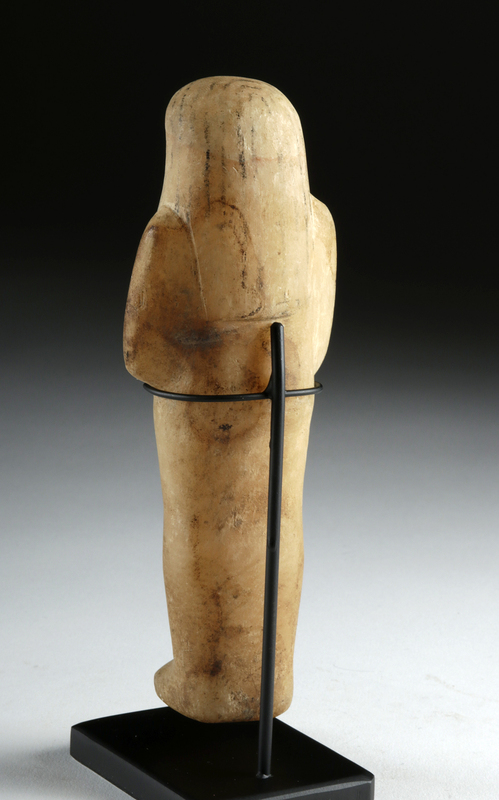 Faint traces of white and red pigment surrounding the figure suggest this sculpture was at one time painted with vivid colors and likely exhibited a column of painted hieroglyphic text down the front of the legs. Custom museum-quality display stand included. Size: 2.2" W x 6.2" H (5.6 cm x 15.7 cm); 6.9" H (17.5 cm) on included custom stand. The ancient Egyptians believed that after they died, their spirits would have to work in the "Field of Reeds" owned by the god of the underworld, Osiris. This meant doing agricultural labor, and it was required by all members of society, from workers to pharaohs. During the Pharaonic period, they had become so necessary and elaborate that some tombs contained one worker for every day of the year and thirty-six overseers, each responsible for ten laborers. Workers like these are from that period of enormous proliferation, and are some of our best surviving insights into ancient Egyptian funerary practices. Condition: Minor nicks to feet, head, and peripheries, small areas of staining along verso, fading to much original pigmentation, and minor abrasions, otherwise intact and excellent. Light earthen deposits as well as nice traces of original pigmentation throughout.